The Rejuvenation Science® Shower Water Filter combines low-profile styling with exclusive filtration media Chlorgon®. Following extensive research and development, the Rejuvenation Science shower water filter provides maximum filtration performance in a minimum sized filter. Designed to extend the showerhead less than any other in-line shower filter, our shower water filter adds only 1½" to the showerhead length. Even though the shower water filter is small in size, it is big in strength. In fact, our shower water filter is made from a high strength plastic that withstands extremely high surface area to pressure loads. The shower water filter cartridge is an inexpensive six-month filter cartridge. It was designed to utilize Chlorgon's® advanced filtration capabilities for removing both free and combined chlorine. Does NOT include showerhead. Reuse your current shower head. Additional $4 per filter may be added for shipments outside the U.S.
Filter Media: CHLORGON®- the first (and only) filtration media designed specifically for the shower. A non-carbon based filtration media, capable of removing both free and combined chlorines, as well as, dirt sediment and odors from the shower. Install on standard ½ - inch threaded shower arm. Unscrew existing showerhead from shower arm. Set showerhead aside. Wrap at least three layers of Teflon® tape around the threads of the shower arm. Teflon® tape is included. Attach the shower filter to the shower arm by hand (do NOT over-tighten). Generally it takes about three turns to secure the filter. Now that the shower filter is installed, wrap about three layers of Teflon® tape around the threads of the shower filter. 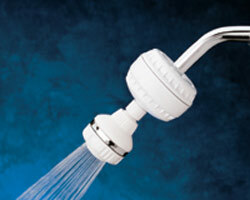 Reinstall your showerhead or install a new showerhead and hand tighten. Turn on the shower and flush the cartridge for about 5 minutes and now you are ready to enjoy a shower with less chlorine. Q: If I have low water pressure, will there be any problems? A: If your water pressure is very low, the shower water filter may reduce your shower to a trickle. If you have very low water pressure, the shower water filter probably won’t work. Q: How long can I expect the shower water filters to last? Q: What has been the feedback from your customers on these shower water filters? A: They either love them or hate them. Some customers prove their strength using tools to over tighten the filters. The filters are made of plastic and will break if over tightened. Be gentle and you will be satisfied with the installation. It may be necessary to use pliers to remove an old showerhead. But hand tightening should be sufficient to install a clean new device. If it doesn’t leak, it’s tight enough. Other customers had low water pressure and were dissatisfied with the flow. Tall customers are annoyed that the height of the showerhead is lowered by 1½ inches. To them we sing, “short people got no reason to . . .” The remainder of customers are generally thrilled and thank us for making their and their loved ones lives better. I have been buying and using this filter for about 7 years now. I would not want to be without it. You can tell the difference in the smell of the water, compared to without, also, there is a big difference in how your hair and skin feels .